Whether you are an artist recording your first album, starting your music career, or topping the charts, having a specialist music accountant or entertainment accountant as a member of your team will allow you to concentrate on the music. We are music specialist accountants who are passionate about helping creative musicians manage the financial side of their businesses. Though we can’t play backup for your band we know, the music industry needs accountants too and that’s where Growth Group comes on stage. While you’re busy touring the world, performing, showcasing, and creating, we’re in our studio (office) keeping the numbers in line. So, if you’re in the music industry, we can help you with all aspects of your financial management. When you choose Growth Group as your music business accountant, you will free up your time and get back to creating! We can help track you travel meals from gigs, hotel stays from shows, and instrument purchases. Entertainers sleep well on the tour bus when Growth Group is handling their musician taxes, entertainment accounting, and record keeping. maximize your income by reviewing royalty statements and getting paid more for events. 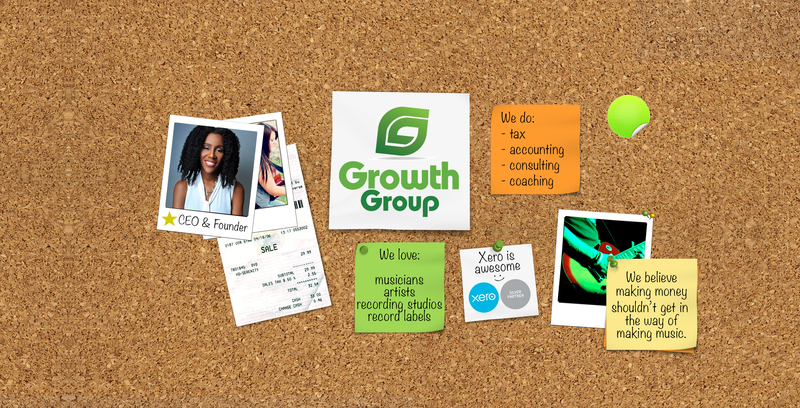 If you’re a songwriter, producer, or artist – Growth Group can be your entertainment and music accountant. Our experience at Growth Group covers many aspects of entertainment. As accountants specializing in music who know how the music industry works we are able to partner with record labels of all sizes, music producers, agents, music studio owners and anyone who requires a music specialist expert. After all, you’ve worked hard to on your craft, so why shouldn’t you reap the rewards? Growth Group can help! Contact Growth Group today and find out how we can help you!